It was in Rio Lagartos, Mexico on our honeymoon on a little motorized boat in the middle of an estuary that flows into the Gulf of Mexico. 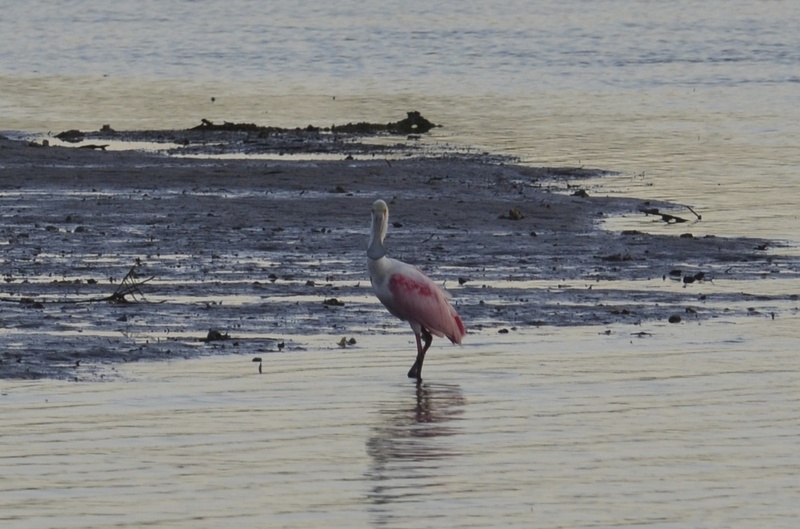 It was that day–that moment–when I saw my first Roseate Spoonbill. “See them?” Steve, my new husband of only a five days asked as he pointed his finger off in the distance. I lifted my small binoculars and tried to focus in. I was still stupid with binoculars, not knowing exactly how to get them to land on a particular spot. (It would be five years of faking my ability to look through binoculars before I finally asked my husband to teach me how to use them.) I attempted to look through my binoculars and went through my typical dizzying, frenetic “method” of trying to locate the bird. I was getting nothing but water and then sky and then water again and then the shoreline. I felt drunk. “No,” I said, giving up. “It’s the pink over there. See them?” he asked again. He was patient with me as he waited for me to find them. The binoculars were making it worse. I gave up on them and squinted into the distance, using just my eyes and then there they were. Three tiny specks of pink. “Flamingos?” I asked. I couldn’t see anything but little pink splotches on the horizon. I so desperately wanted to get a closer look. 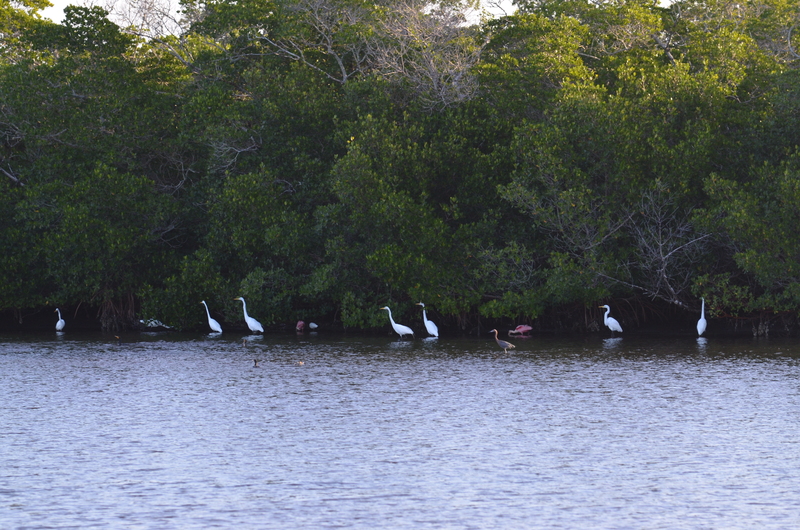 Our guide turned the motor back on and the boat crept along the water, but the pink blobs flew away. 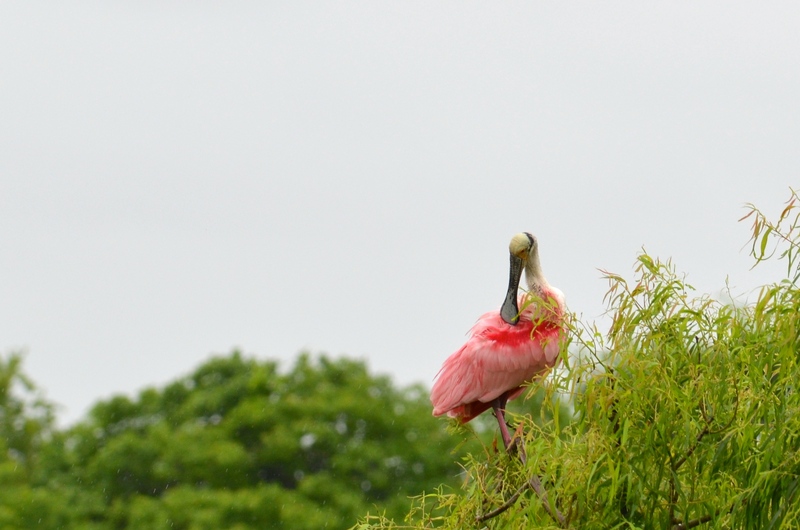 That was my first encounter with Roseate Spoonbills. Hardly worth bragging about, for certain. Six years later I was in Florida on Captiva Island for a week of business meetings and before I caught my plane to return home I visited N. Ding Darling National Wildlife Refuge at nearby Sanibel Island and only a 20 minute drive from where I was staying. 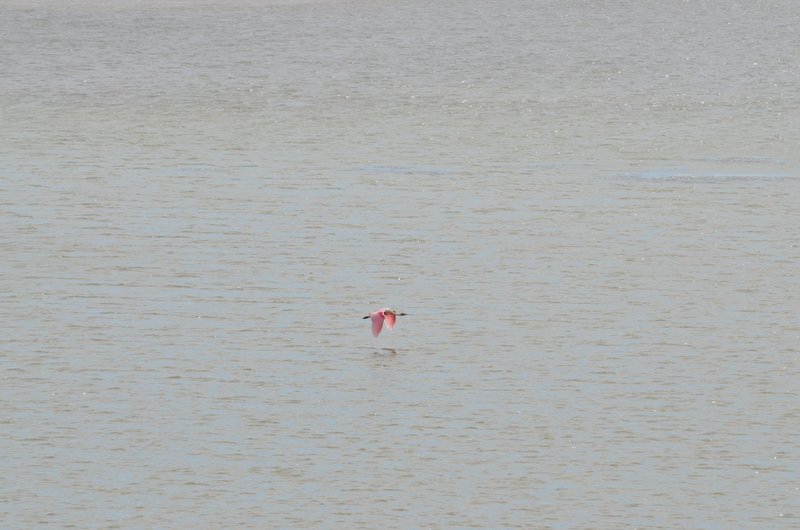 I knew there would be Roseate Spoonbills and I was looking forward to getting a closer look at them, but alas I was an idiot and forgot to pack my binoculars, though I did have my camera. 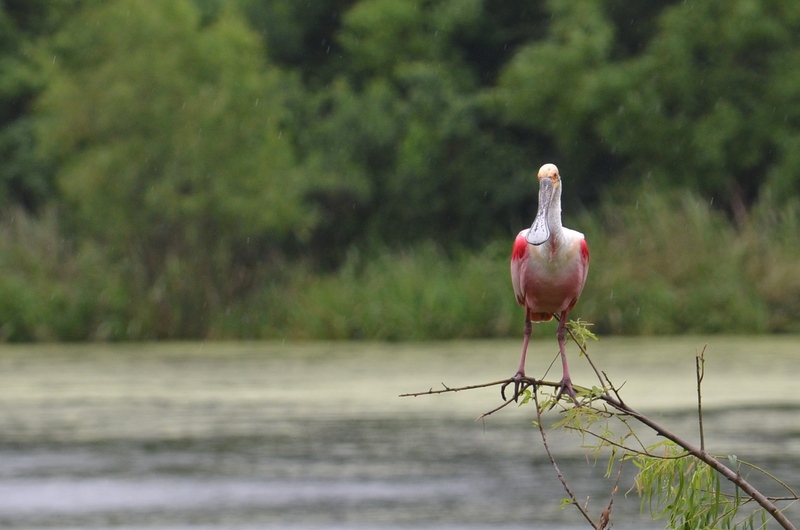 I imagined being surrounded by Roseate Spoonbills, but all the herons and egrets notwithstanding, I saw only a few Roseate Spoonbills and couldn’t get a close enough look at them. Though, here’s a better look from a cropped-in image from that same day in Florida. Cropping in isn’t my favorite thing to do. I generally only do that to get a better look or to provide you a closer inspection of the details. 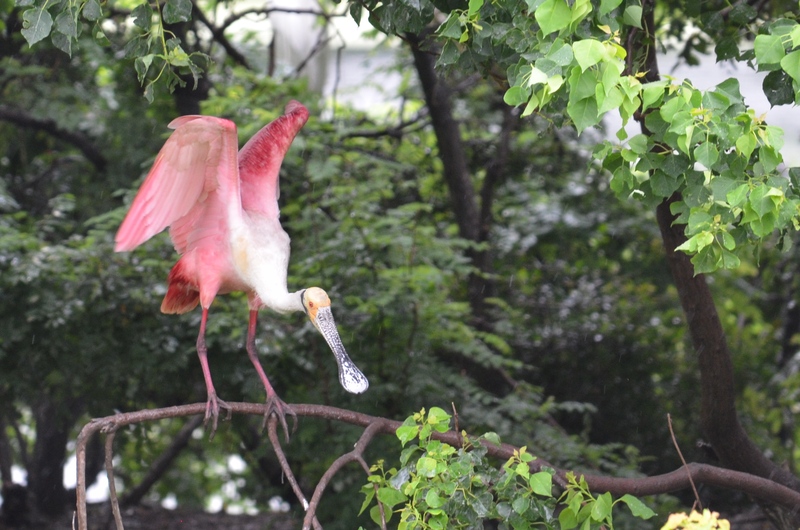 Last Fall Steve and I went to southern Florida on holiday and I was determined to get my closer look at the Roseate Spoonbill and its oddly shaped bill. 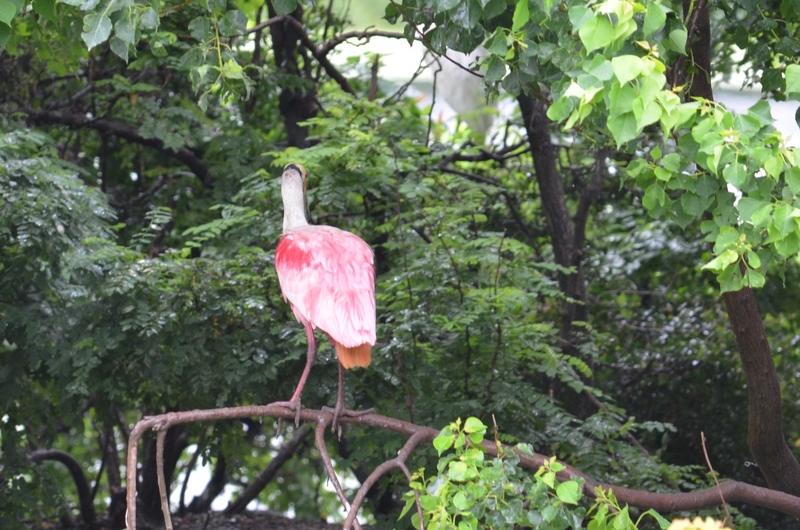 Again, the elusive pink and white bird failed to give me the look I craved. My only good view was a fleeting fly by in the distance. “Of course,” he assured me. My heart fluttered with the glee of anticipation. Never mind that my previous opportunities didn’t garner great looks. Birders never give up searching. And this time I knew exactly how to use my binoculars. After arriving at the Smith Oaks Sanctuary we took the short walk on a clear path under the shade of trees, hearing the cacophony of cackling and grunting and gobbling. It had been a soggy morning and the rain was still coming down, and there didn’t appear to be anyone around. Area birders must have decided to stay out of the rain today. The first bend in the path curved to an opening and there was a covered outlook with benches. I quickened my pace to get under the roof and then I turned to the open water that revealed hundreds–no, maybe a thousand?–egrets, herons and Roseate Spoonbills, perched, sitting on nests, flying in, flying out, stretching their wings, squabbling over space on a branch, preening, snoozing, or just looking pretty. 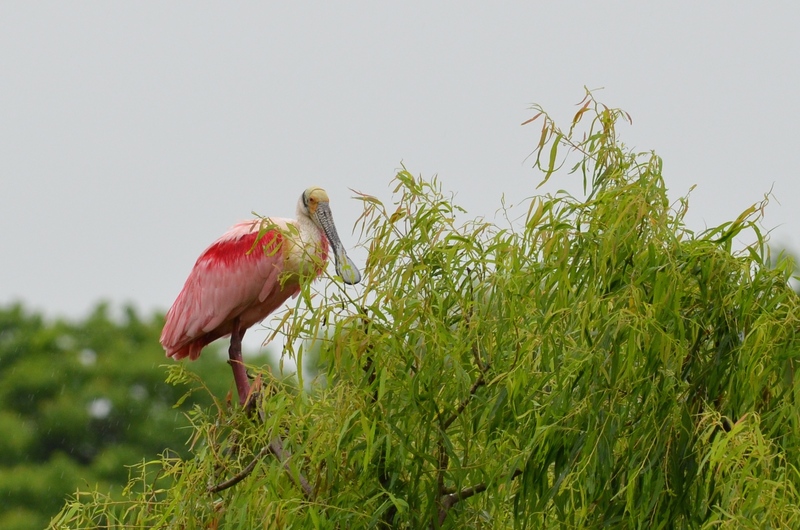 Just over seven years after that first glance in Rio Lagartos, our move to Texas payed off in terms of getting a good look at the Roseate Spoonbill. Here you get a great view of his short stubby orange tail. And then he turned around and gave me a great view under his wings as he stretched. Here you see the gray detail of his bill, which oddly seemed more interesting than the shape of his bill. And of course, one needs to take time to preen. But nothing beats a spectacular pink cotton candy flyby from a guy you’ve been dying to see for seven years. 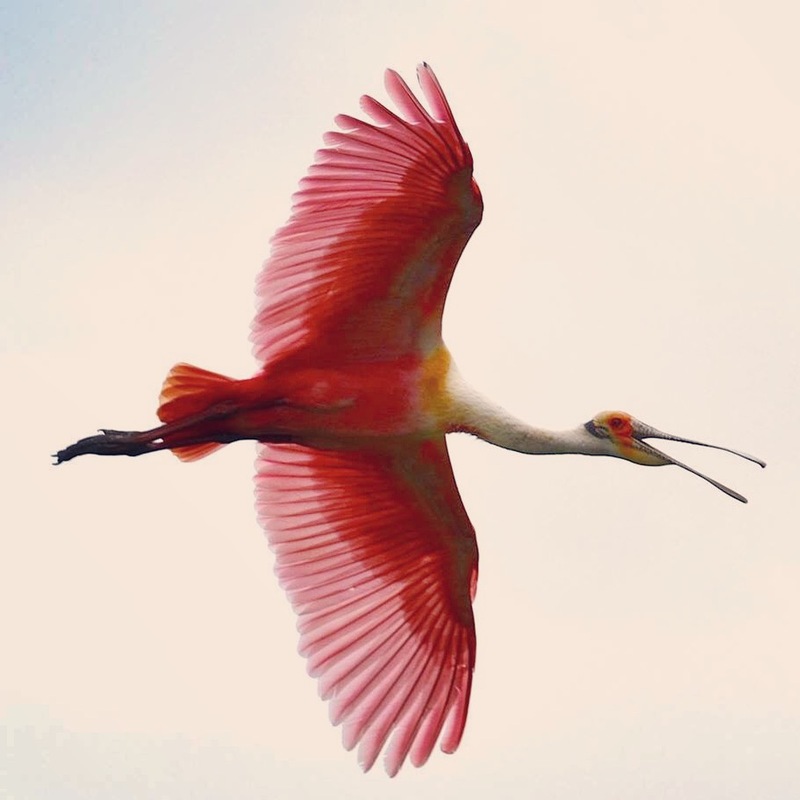 Sensational flying bird of the day. Only 17? I can do far more than that. Smith Oaks is one of our favorite spots to bird as a family. It’s Boy Scout Woods in April for the migrants and the Rookery in May for the babies. Always worth the drive! Your photos are wonderful, especially that last spread. Thank you! We stopped by the Boy Scout Woods before we went to the rookery. It was really quiet, and we figured it was probably busier and more birdy during migration. I’m already looking forward to Spring Migration!